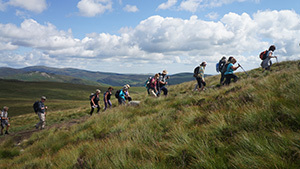 Following the success of last year’s #CaminoFestIrl photo competition we are running it again this year and we’ll have fab prizes for the best shots of the CaminoWays.com walking festival. 1. Follow @caminoways on Facebook,Twitter, Instagram and/or Pinterest. 3. Use the hashtag #caminofestirl and tag @caminoways. 4. Take and post as many pictures as you like! 5. We’ll keep the competition open for one week (until Monday 3rd August), for those of you who prefer taking your big camera with you! 6. Winners will be announced in mid-August. 7. Pictures must be taken at the CaminoWays.com Walking Festival on Saturday 25th during the walks or at basecamp. We have prizes for the best shots of the day! -2 vouchers worth €100 for any CaminoWays.com or IrelandWays.com holiday. -2 vouchers for the FoodFiesta.ie cafe at Instituto Cervantes. -A voucher from outdoor specialists 53 Degrees North. -One 6-month membership for Raw Condition Fitness. -4 fantastic leak free water bottles from Contigo Europe. -2 Camino de Santiago head gear from Buff UK. -A one-day survival course with Survivalist Ireland. Looking forward to seeing your pictures! See the photography competition winners from last year. We’ll also have fantastic prizes to give away on the day. Winners will be chosen by CaminoWays.com staff and their decision is final. Prizes can’t be exchanged for cash or discounts. CaminoWays.com and prize sponsors are not responsible for any damage/fault/warranty for prizes provided. Pictures will be shared by CaminoWays.com in various social media profiles (including Facebook, Twitter, Pinterest, etc…). Be aware that pictures submitted for the #caminofestirl photography competition could be used for future promotion/marketing materials by CaminoWays.com and the competition prize sponsors.